How do you handle the information for the ‘blind’ player? Do you provide him with maps, a narrative, or maps and a narrative? Sounds like serious fun. That’s a gorgeous little table, by the way. The picoarmor looks great, too. Very cool. Much more interesting than anything a guitar player-turned-wargamer could get up to! sounds interesting i would like to see an example of how your solo system works any chance of an example of play ? Hi there, I will be updating this project as I go but unfortunately things have been a little hectic of late so it won’t be for a little while, however, as an example I will run through a little scenario for you now. I would normally in solo play use a set of cards (as stated in the post) with orders and would choose say, 1 card per unit and for the Canadians 1 card for their initiative level thus giving me some leeway to best suit the circumstance. In this case I choose 2 cards (1 for the tank unit and 1 for initiative) I draw (randomly) a ‘Move’ and a ‘Fire’ card. Now I’m not happy charging forward without an idea of what is waiting for me so using the Crossfire rules I decide to give 2x Tanks the fire order and use the rule ‘recon by fire’, if successful this order (on the roll of a 6) lets me know what, if anything, is in a chosen piece of terrain (Think of the movie ‘We were Soldiers’ when Hal Moore orders the soldiers to fire 3 rounds at anything that looks suspicious, straight away all hell breaks loose as the enemy think they have been spotted). 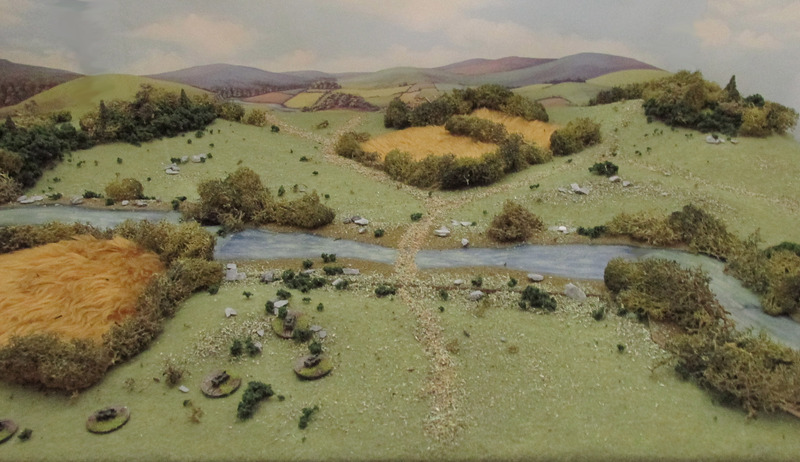 I don’t like the look of that hill on the right so I choose that and roll 1x six-sided dice (D6) per tank. I roll a 3 and a 6, one success! 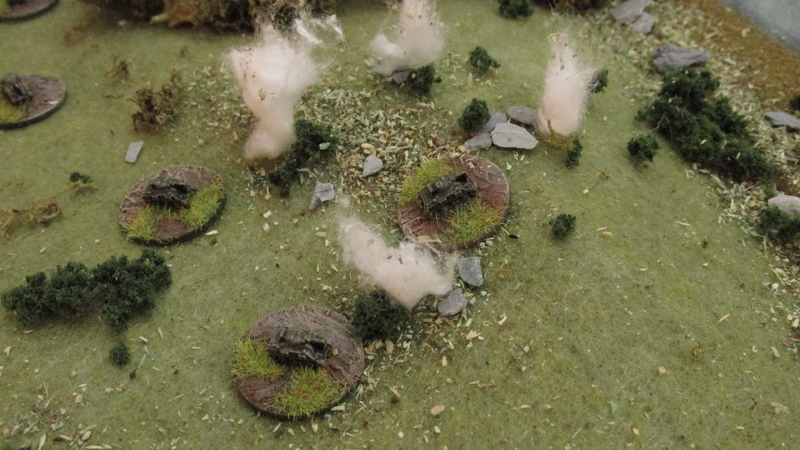 I already know that there is an HMG and 2x Rifle Squads in there but my little models didn’t. 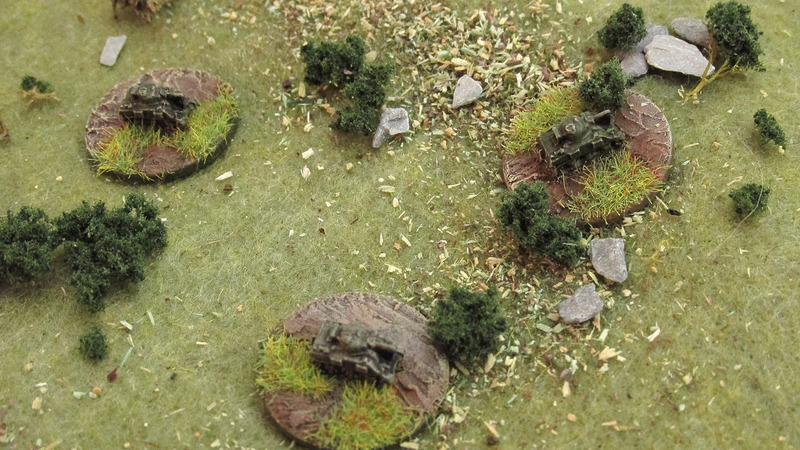 I roll the dice separately for each and only 1x rifle squad stays hidden, the other two open up and give away their position allowing the Canadians to keep the initiative. The AT Gun knocks out the lead Tank but as they were moving together the following Tank can finish it’s move whilst the ATG is reloading. The Canadians have now lost the initiative so It is the Germans turn. I draw 1x card per unit and 2 extra (as the Germans are well known for their high initiative). As I have at least 2 ‘Fire’ orders I decide to open fire at the remaining Tank with the AT Gun, knocking it out and keeping the initiative for the Germans. I hope this gives you a little taste of how I conduct my Solo play. Thanks for your reply your solo play ideas are unusual i would be interested to see how an engagement unfolds . The unique feature of crossfire is that it is rules and tables light , the idea of bringing in a command structure element is something that ive been considering for some time ..while reading Blackhawk Down i was struck by how the communications between different elements ,fire teams , vehicles ,helicopters ,aerial observers and HQs lead to a chaotic situation on the ground . I was thinking about how to graft these communication issues into the crossfire system .One way could be to use the pin /suppress success numbers as a pass/fail to communicate with other stands , leaders or HQs , a failure could leave a fireteam unable/unwilling/ to move until ordered to do so. Situational Awareness always crops up in military accounts , because fireteam Alpha can see something ahead doesn’t mean team Bravo can see it, who are street away or inside a structure .The problem is how to simulate the perspective from each individual stands point of view , without getting into over complex charts and tables , any ideas ?